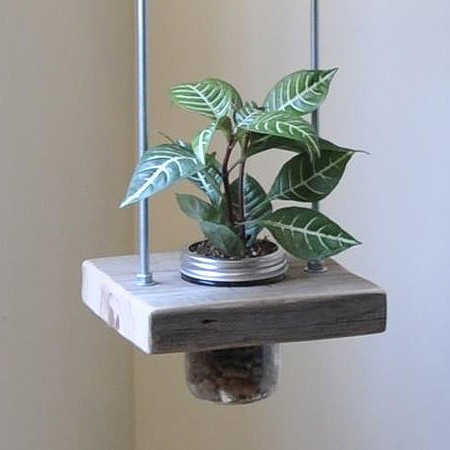 Make this vertical planter using blocks of reclaimed wood, threaded rods and nuts, and some recycled food jars or mason jars. Susie Frazier designs a range of eco-art and lifestyle products inspired by reclaimed materials salvaged from natural and industrial landscapes. *The drill bit should be the same diameter as the threaded rod. The hole saw should be the same diameter as the neck of the glass jars you will be using. 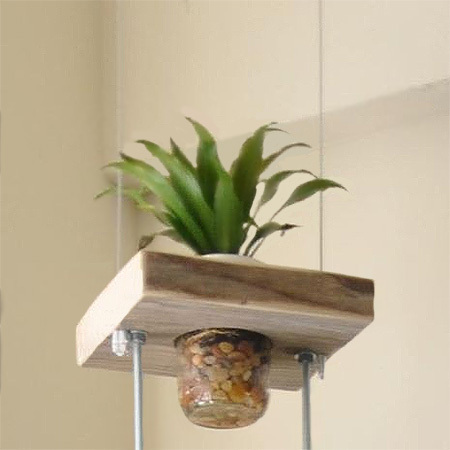 The lid or lip of the jar must be able to hold the jar on top of the wood block. 1. Use a drill and hole saw to drill out a hole in the centre of each block and sand smooth. 2. Drill a hole at the centre on each side of the wood blocks. This needs to be accurately marked so that the blocks align properly when hung. 3. 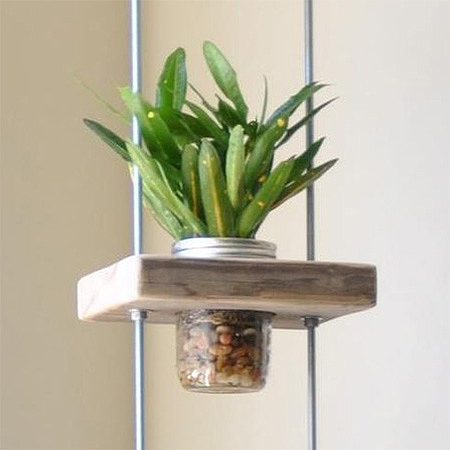 You can make the height of the vertical planter to the length of the threaded rods you are able to find. Builders stock varied lengths but you can also buy threaded rod from local steel merchants. 4. Starting at the bottom, feed the rods through the holes and place a washer and nut at the end (underneath the wood block). Also place a washer an nut at the top of the wood block. Allow plenty of space for plant growth before repeating this for every wood block. Use a wrench or pliers to make sure that the nuts are tight. 5. Fill the bottom third of the jar with small pebbles. This will ensure that plants drain and roots don't become water-logged and rot. Top with soil and add your plant, topping up with soil as needed. Slot the jar into the hole in the centre of the wood blocks. NOTE: If you are using mason jars or canning jars simply remove the centre cap. If you are recycling glass jars you will need to cut a hole in the lid to allow for planting. 6. Drill two additional holes in the top block to thread through nylon line. Do a double knot underneath the wood block and tie off the top of the nylon line to eye hooks that can be screwed into a ceiling beam.